Hungry For A Meal? Try A Savory Crepe! Hey, You Can Still Have That Sweet Crepe For Dessert Later! This webpage is home to several savory crepe recipes. 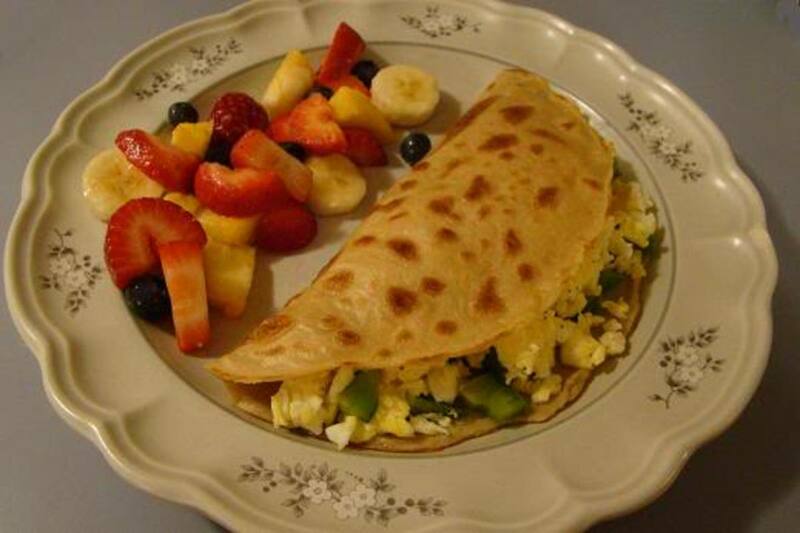 Savory crepes make great meals for lunch or dinner, yet are simple enough for a quick, afternoon snack! My personal favorite? The Quesadilla Crepe! (pictured above) It's a lot like a quesadilla, filled with your choice of onions, green peppers, black or pinto beans, corn, cheese, avocado, etc. Yet instead of wrapping it up in a tortilla, it's all folded into a scrumptious homemade crepe! You wouldn't believe how simple and delicious these are! My savory crepe recipes can be found below. Just scroll down the page, or look for specific recipes in the Table of Contents! If you're looking for breakfast or dessert crepe ideas instead, there are quite a number of those on my Breakfast and Dessert Crepe page, as well as my Double Decker Dessert Crepes page. TheEgg and Bell Pepper Crepes on my Breakfast Crepe page might be a nice choice for lunch or dinner as well! You'll find several crepe making and storing tips, along with crepe makers, crepe spatulas, crepe pans, vegan crepe recipes, gluten-free recipes and many other things related to crepes on the home page of this site: Crepe Central. Have you ever made crepes before? Yes, I make them often! Yes, I've made them at least once before. No, but I'd like to try making them. Me? Make crepes? I just want to eat them! I'll leave it to someone else to make them! This is the basic recipe for the crepes themselves. Some suggested filling ideas can be found below it. Optional - Try adding fresh or dried herbs to the batter. Preheat a pan on medium heat with a very small amount of vegetable oil. The oil should just barely mist the bottom of the pan. When the pan is warm, pick it up off the stove and hold it while you pour a small amount of batter (about 1/4 cup..although I don't measure it) into it. 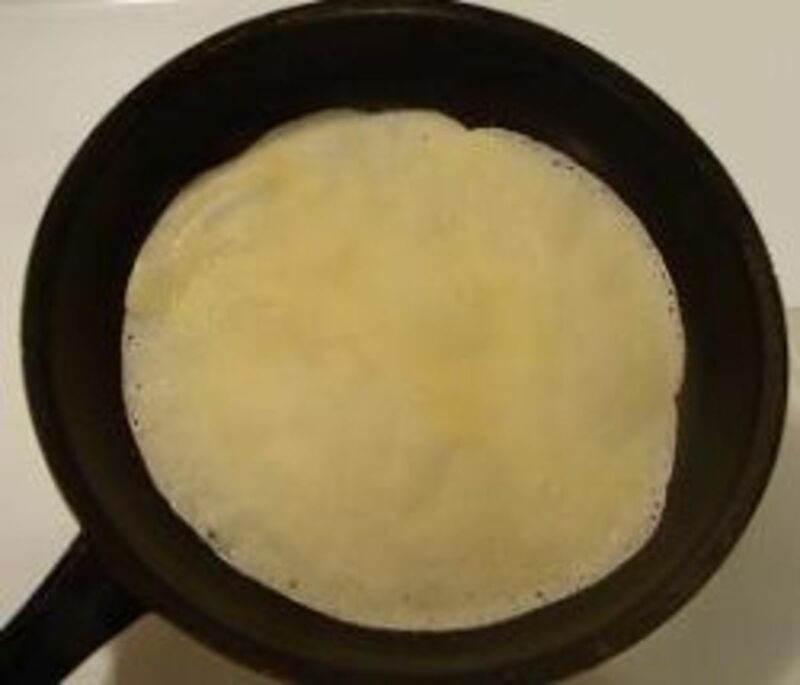 As you are pouring the batter, tilt the pan slowly in all directions so that the batter spreads in a very thin layer across the bottom.When the edges start peeling away from the pan, or when the edges become lightly golden (whichever comes first), gently loosen the crepe with a spatula and flip the crepe over in the pan. The second side should cook much more quickly. In my opinion, the best, most delicate and delicious crepes are cooked until they have only just a hint of color. Cheesy Potatoes & Other Veggies Dinner Crepes Recipe - Crepes with broccoli, onion, mushrooms, zucchini, bell pepper, potatoes, and cheese. Peel and chop potatoes. Steam them for about 10 to 15 minutes, or until just tender, but not soft. While the potatoes are cooking, sauté the onion and bell pepper in oil in a large skillet until soft. Add the potatoes to the onions and bell pepper. Add salt and pepper to taste. Continue to cook over medium heat, stirring often, until the potatoes are soft. Steam the mushrooms, zucchini, and broccoli about five minutes. Add the mushrooms, zucchini and broccoli to the skillet. Prepare the Basic Dinner Crepes. Each person places a crepe on his plate, fills it with a row of veggies (see picture above), adds cheese, and rolls it up. Additional cheese can be added on top of the rolled crepe, if you'd like! Mexican Flavored Crepes - What toppings would you like on yours? Aren't crepes supposed to be French? Perhaps so, but they make nice wraps for Mexican foods too! I love the delicate taste of a crepe in place of a tortilla! It makes the dish seem much lighter to me! Homemade crepes are healthier than store-bought tortillas too! And it takes only minutes to make them - seriously! The crepe pictured here contains scrambled eggs, bell pepper, onions, black beans, cheddar cheese, and salsa. I would have added avocado slices or guacamole too, if I'd had some on hand. You can use whatever ingredients you like on burritos. I've listed a few suggestions below. And anything else you enjoy on burritos! Make the crepes, add the filling, roll 'em up, add any toppings you'd like, and they're ready to eat! Crepe pans need to have low, slanted sides, as this one does. If they don't, it's very difficult to flip the crepes over without destroying them. They also need to be non-stick. This is an excellent crepe pan that's made of blue carbon steel. This pan has low sides which aids in turning the crepes. (Because crepes go all the way to the edge of the pan, having a pan with low sides is really important. Otherwise, the sides get in the way. )This crepe pan has a 1/8 inch thickness, for better distribution of heat! This pan can be used for a variety of things. It can even be used in the oven up to 450 degrees F.
Do you prefer larger crepes, or smaller ones? This pan makes larger crepes. I find it to be a little easier for beginners to make smaller crepes (with a smaller sized pan), but whether you are a beginner or not, if you're interested in making large crepes, this may be the pan for which you're looking. Quesadilla Crepes are similar to Mexicani Crepes, except that I add the filling ingredients to the crepe while it is finishing cooking. This allows the cheese inside the crepe to get melted, and the cheese on the outside of the crepe to at least get started melting! The taste is very much like a quesadilla, only lighter. In the quesadilla crepe shown above, I used whole wheat crepes, bell pepper, red onion, corn, cheddar cheese, black beans, and fresh avocado. My quesadilla crepe is still in the pan cooking in the photo above, but after placing it on a plate, I added salsa to the top. Feel free to use whatever quesadilla ingredients you prefer in yours! 1 batch of the basic crepes recipe batter (Don't cook the batter into crepes yet). Have all of your filling ingredients grated or chopped, and ready to add. Pour a small amount of crepe batter onto the pan, tilting the pan so that the batter covers the bottom of the pan in a thin layer. When the edges of crepe starts to pull away from the pan, flip the crepe over and immediately add the grated cheese to one half of the top of the crepe. 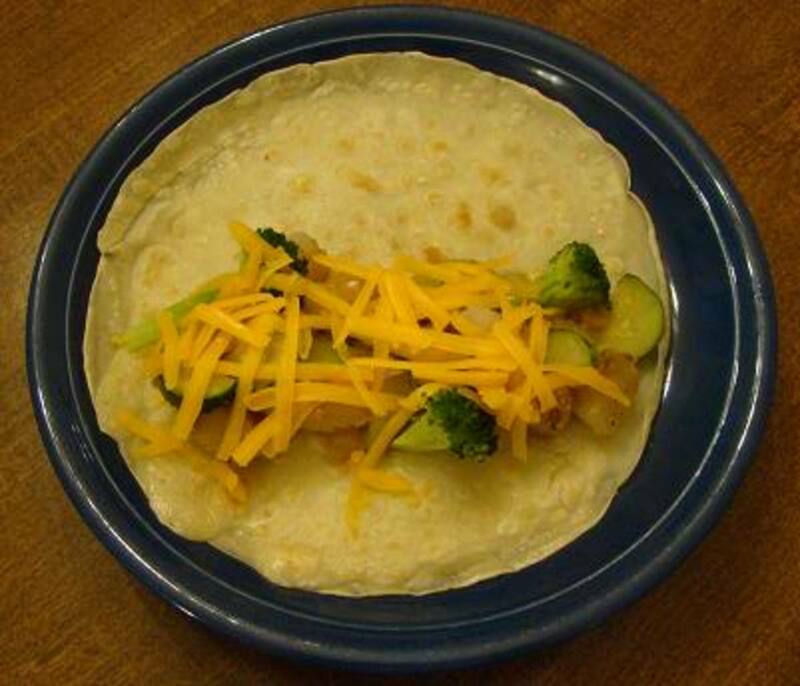 Put the other filling ingredients on top of the cheese, then fold the crepe over, so that the empty half of the crepe covers the filling, creating what somewhat resembles a taco. If you are adding cheese to the top of the crepe, do so now. The cheese inside the crepe will melt quickly, but the cheese on the top will take a little longer. 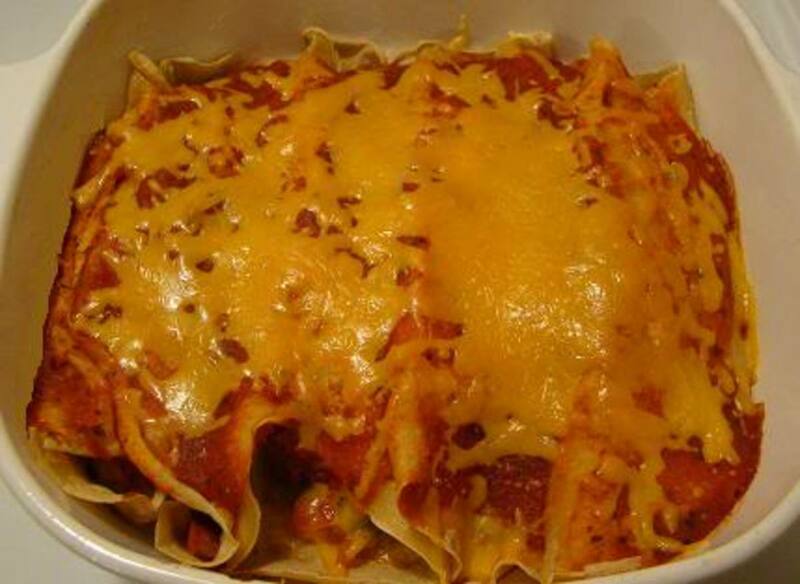 You can speed the process up by adding a lid to your pan, and by using very finely grated cheese. Of course, it tastes great whether the cheese on top melts very much or not!! Wash and cut broccoli into bite sized pieces. Steam in a steamer basket on the stove until tender (about 3 minutes). 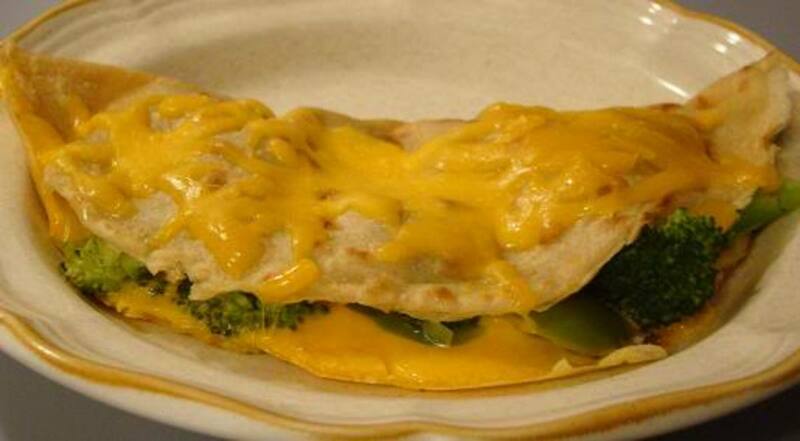 While the broccoli is steaming, grate the amount of cheddar cheese you'd like to use for the filling and the topping of the crepe. (Or you can cut thin slices of cheese for the filling and grate only the amount you want for the topping.) I don't measure my cheese, but usually use about 5 thin slices of cheese for the filling and about 1/8 of a cup of grated cheese for the topping. Preheat a pan with low, slanted slides on medium heat, using a very small amount of vegetable oil on the bottom of the pan. If you get too much oil, wipe some of it out, or your first crepe won't turn out well. The oil should only barely cover the bottom of the pan. Mix the flour, salt, water, and egg into a small bowl, mashing out any lumps you see. Pour a small amount of crepe batter onto the preheated pan, turning the pan while you pour to spread the batter in thin layer all over the bottom of the pan. When the edges of the crepe start to pull away from the pan, carefully flip the crepe over. Immediately after you flip the crepe, add the thin cheese slices (or some of the grated cheese, if you've grated it all) to one half of the crepe. Put the steamed broccoli on top of the cheese. Wait thirty seconds to one minute, and fold the empty half of the crepe over the broccoli and cheese side of the crepe. Immediately add the grated cheese to the top of the folded crepe and cover your pan with a lid. When the cheese is melted to your liking, remove the crepe from the pan and enjoy! 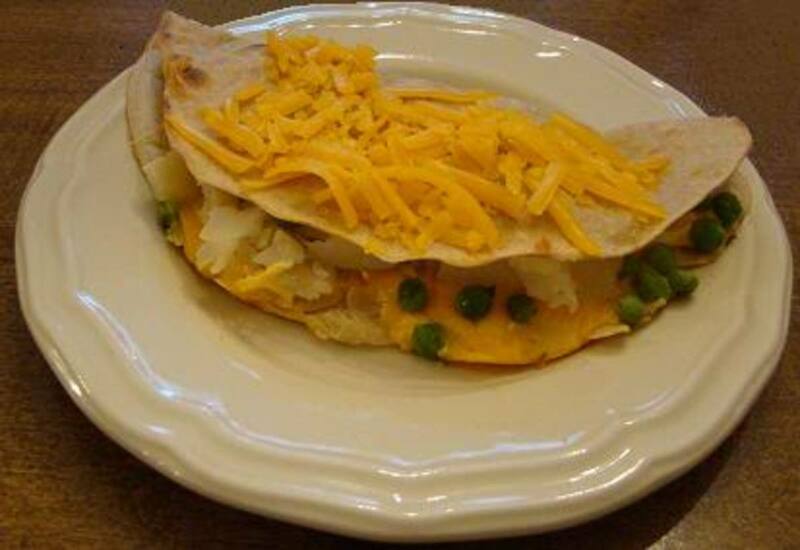 Baked Potato Crepes - A great way to use up leftover baked potatoes! Mix all the crepe batter ingredients into a medium sized mixing bowl. The batter should be much thinner than for pancakes. Preheat a pan on medium heat with a very small amount of vegetable oil. The oil should just barely mist the bottom of the pan. When the pan is warm, pick it up off the stove and hold it while you pour a small amount of batter (about 1/4 cup..although I don't measure it) into it. As you are pouring the batter, tilt the pan slowly in all directions so that the batter spreads in a very thin layer across the bottom. When the edges start peeling away from the pan, or when the edges become lightly golden (whichever comes first), gently loosen the crepe with a spatula and flip the crepe over in the pan. 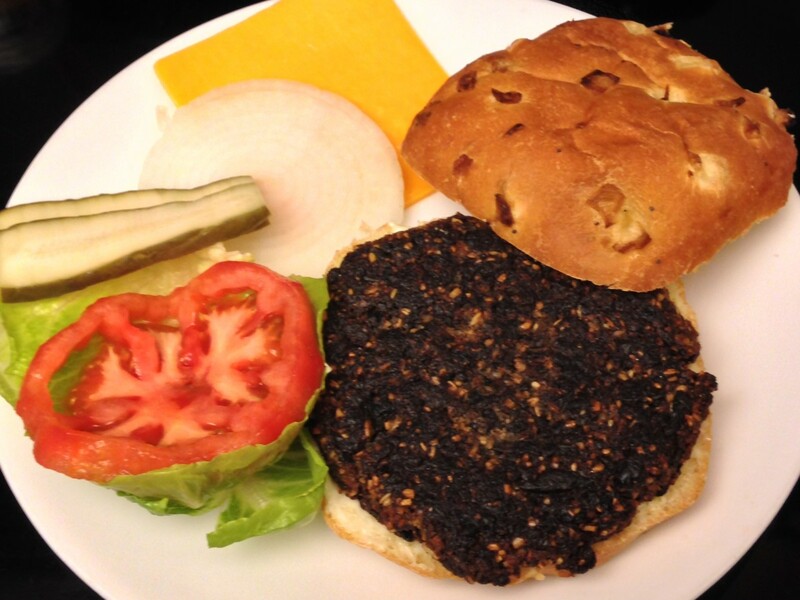 This is the time to add your filling ingredients! If you are using cheese, place that directly on one half of the side of the crepe that is facing up, as the other side of the crepe is starting to cook. Next lay pieces of baked potato on top of that. Add salt, pepper, or other seasonings, followed by any other filling ingredients you'd like to add. Fold the crepe in half and top with grated cheese, if desired. Cover the crepe with a lid to hasten the melting of the cheese on top. (Or you can add the grated cheese on the top after placing the crepe on the plate, although it won't melt much that way.) When the cheese inside the crepe is mostly melted, the crepe is ready to eat! 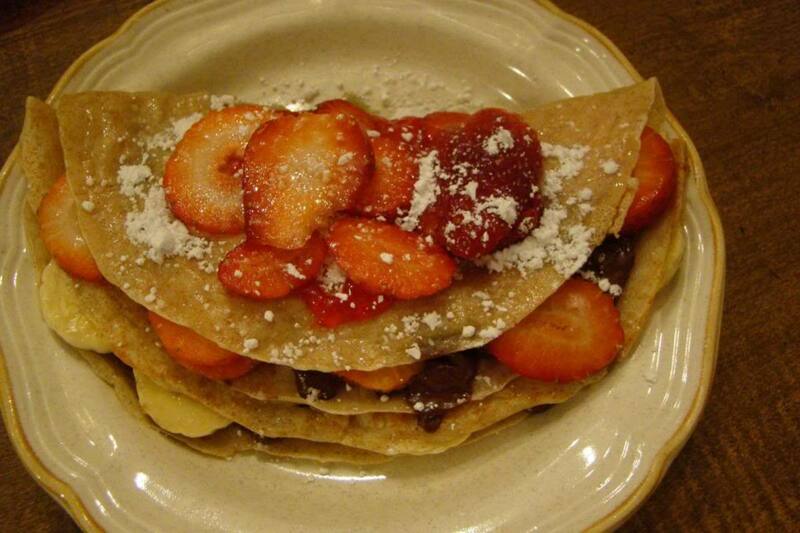 My other webpages about crepes - Sweet Crepe Recipes! Tips and Techniques! Crepe Pans and Makers! Crepe Cookbooks! *A particular type of sweet crepe. These have 2 layers stacked on top of each other! *Detailed illustrated instructions on how to make crepes. If you're looking for more crepe recipes, you'll find some sweet and savory ones in this cookbook. This book is for the kindle! Did you know that you can download a free "Kindle for PC" from Amazon and use it to read kindle books on your computer? Are you a vegetarian? Vegan? Meat eater? A Crepe Cookbook (for the crepe lovers of the world!) - Beware! 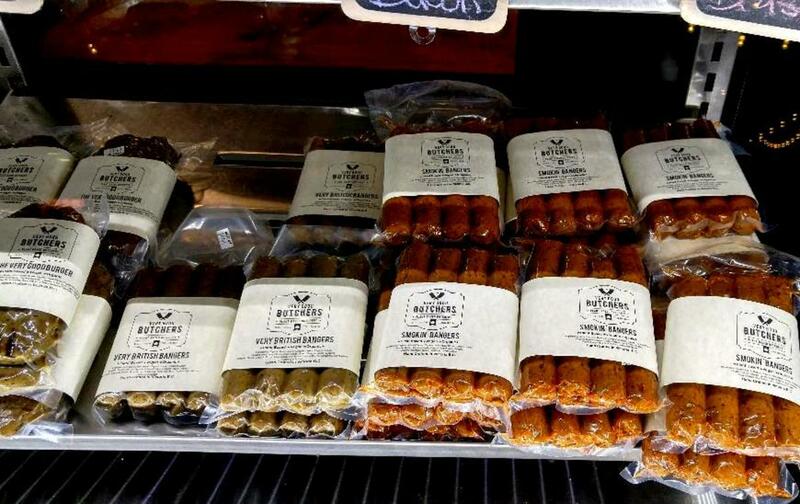 Reading this might make you hungry! Do these sound good? Spiced Tangerine Crepes Susette. Mixed Berry Crepes with Ginger and Mascarpone. Bittersweet Chocolate Whipped Cream Crepes With Mocha Sauce. Roasted Pineapple Crepes With Toasted Coconut Macadamia Crunch and Spiced Rum-Butter Sauce. How about: Spiced Indian Potato and Chickpea Crepes? Crepes with Sauteed Pears, Aged Gouda, and Fresh Thyme. Hummus, Roasted Red Pepper, and Feta Crepes. Roasted Eggplant, Tomato, and Garlic Crepes. And the list goes on an on.... There's 50 of them! Are you hungry from reading the list of crepes you can make from this book? I am! 50 Savory and Sweet Crepe Recipes For You To Try! 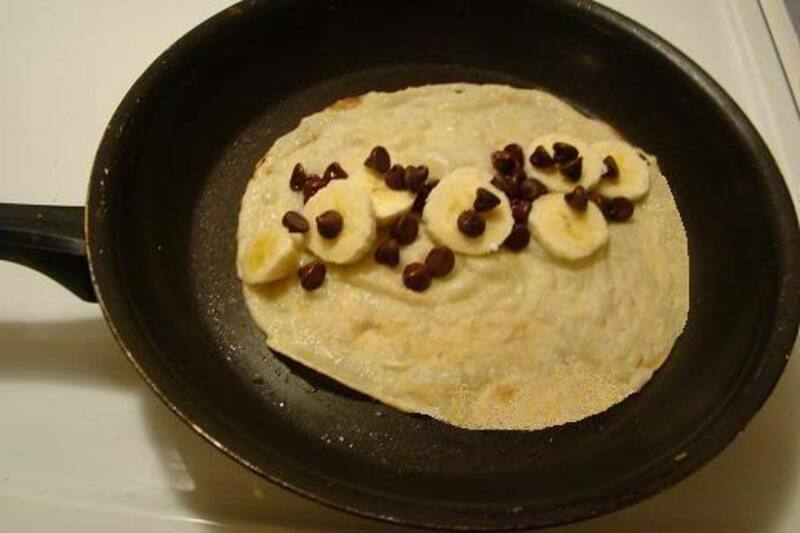 Some recipes for Vegan Crepe Batter can be found on my Crepes Central page. Asparagus Crepes with Mushroom Dill-Sauce- Vegan. 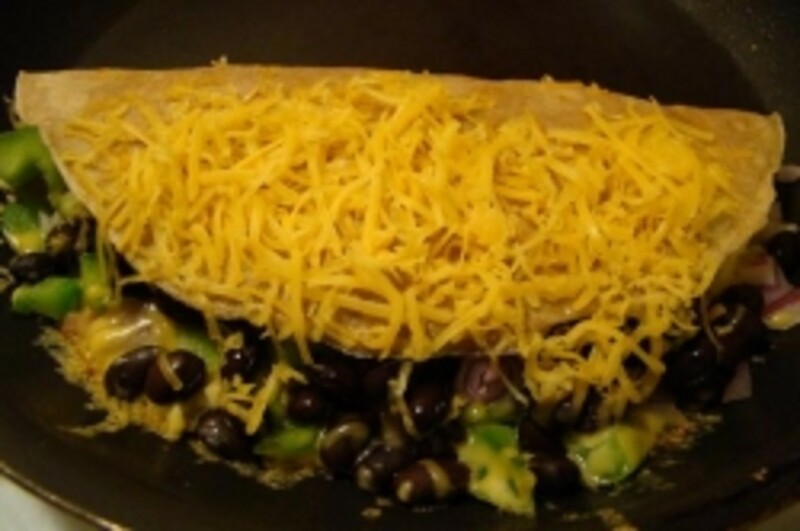 Black Bean and Chili Corn Crepes - Vegetarian. California Asparagus and Mushroom Filled Crepes - Vegetarian. Grilled Veggies Crepe - Vegan. Herbed Crepes With Ricotta, Bell Pepper, and Spring Tomato Sauce - Vegetarian. 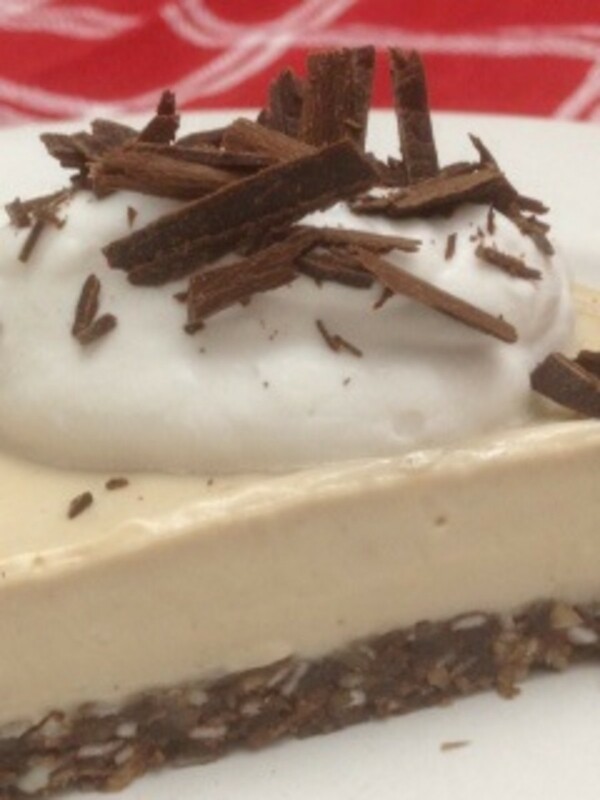 Hot Vegetable Torte - Vegetarian. Spinach Filled Crepes - Vegetarian. Vegetable Crepe Medley - Vegetarian. Wild Rice And Corn Crepes - Vegetarian. Comments and Questions - Thanks for visiting my savory crepes site! Delicious recipes for crepes to have for lunch or dinner. I would love to try them all sometime. Voted up! Yum! And on our G+ page today! Yummy yummy, love crepes but never seem to make them since the kids are grown. I love crÃªpes, I usually made CrÃªpes Suzettes for dessert. As a main dish I love mushroom crÃªpes or shrimps crÃªpes, they are so good. Thanks a lot for sharing all those wonderful crepe recipes! Wonderful lens!!! These look yummy. I will definitely have to try a few. yummy, i like the recipes. I think savory crepes balance out all the juicing and vegetable broth we are eating these days! Thank you. Crepes are wonderful with anything, and this lens gave me many examples :) I know this lens is about salty crepes, but if you like also sweet crepes, try the banana and chocolate one, it's huge! Now i'm hungry, I gotta go eat. Stopping back and able to leave some fresh angel dust on this deliciousness....my mouth was doing back flips all the way down....savory! Some of these are now on my must try list! They look so savory, my mouth is watering! Wow! These all look so delicious. I think I'll try that quesadilla one for sure. Blessed! These all sound so delicious! Crepes are so light and yummy! Every time I come over to visit you, I get so hungry! lol Your recipes always sound yummy. Thanks for sharing them with us. My grandmother always made crepes for me when I was a little girl. She would smear Strawberry jelly in them. Sometimes we would take the plain crepes, roll them and cut them into thin strips. Then we would put a handful into a nice hot beefy soup in place of noodles! Delicious...Such a lovely lens. Thank you for sharing and bringing back good memories for me. Fabulous collection of recipes! Can't wait to try some of these. Think I'll start with that no-cook avocado corn salsa. I have just recently "discovered" crepes and how easy they are and tasty to make. I will definitely be adding some of your yummy recipes to my collection! QuÃ© bueno todo! muy buenas ideas. I have never tried crepes at home. But the recipes here induced me to try some crepe recipes. 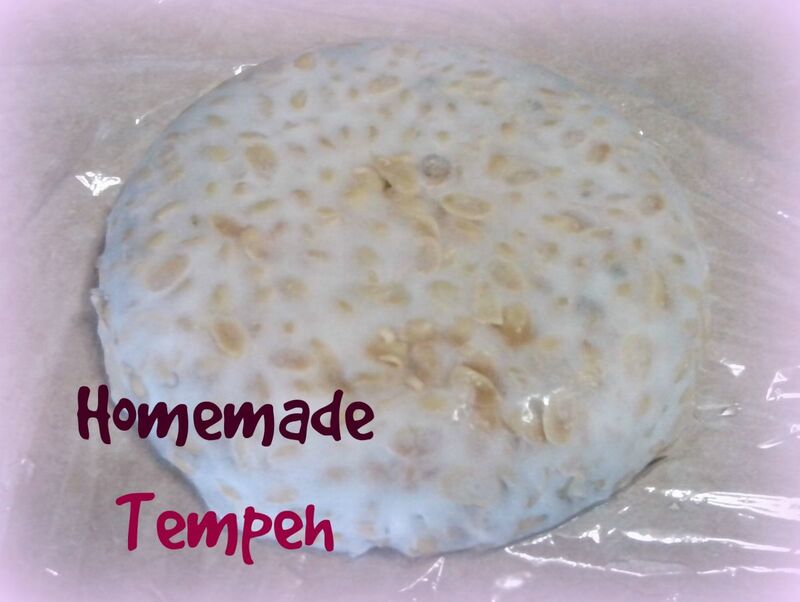 I am going to try any one of the recipe this tuesday. What Yummy crepes. I just love the pictures. I'll try some of the recipes. My savoury crepes are usually Cheese and ham, garnished with mushrooms. Delicious! Love crepes, especially those with straberries and choco! Mmmmm! Stopping back to let my mouth water over your savory lunch and dinner crepes, a picture does point a thousand delicious words! I'd skip having to clean a food processor to...take that you lumps! I love savory crepes! Your lens made me hungry. The pictures look delicious, thanks for sharing a wonderful lens. Looks so delicious! Thank you for sharing! I'm defintely going to try a few of these! I've added it to my Make Pancakes recipe so that others can have a go at these too. Thanks for all the recipes - like the spinnach and cheese crepe ! I'm going to have to stop looking at lenses with food. Now I'm hungry again. Nicely done. Lovely recipes! I'll be trying them all! Very interesting combinations - ones that I never would have thought about on my own! Thanks! Since I love quesadillas I'd have to say that would be the first type of lunch/dinner crepe I'd make. Who doesn't like crepes? I mean seriously, they are the best! these all look so delicious. I love crepes but don't know a lot of recipes for them but this lens helps with that issue. Great lens! delicious recipes, I am not a vegetarian, but I never eat meet. I have had mushroom and chicken savory crepes before.. they are delish.. and these sound amazing, too! Blessed! Yum. I love crepes. I will definitely try some of these recipes. All of the recipes sound so good!Great lens! Great lens - blessed by a travelling angel. I don't have crepes often, but I love them. I haven't had crepes in years. Great Lense! I'd eat this no problem, 'thumbs up' from this eater! I love crepes! nice lens! It's like pancakes with veggies. Really good recipes. I'll skip the eggs though! Great lens - love the vegetarian emphasis! Thanks for sharing! I'm starting vegan diet, this is heaven sent! gotta try all those recipes! yum! Crepes were a stable when I was raising children, but now I'd like a gluten-free recipe so I could enjoy all your enticing fillings. great job! The food looks delicious and I am now headed to a restaurant that serves Spanish food. Great recipes! holy crepe! I really wanted to say that! hehehe! I love crepes! I remember the first time I made one was in my home ec class when I was in 8th grade. They go with everything! I can't wait to make some again! Thanks for the great lens! My grandmother used to make all kinds of crepe recipes but she called them palachinka. I am vegggie food lover.. Thanks for sharing nice Stuff here!! Great sounding recipes. Deserving of another angel blessing. Lots of great ideas - rolling to my Tips for New Cooks lens. I now know what I'm cooking for dinner tonight! Thanks for the great recipes. I'm heading to my kitchen now.